At lunch I went to the Tulsa suburb of Sperry, Oklahoma, a dozen or so miles north of Tulsa. 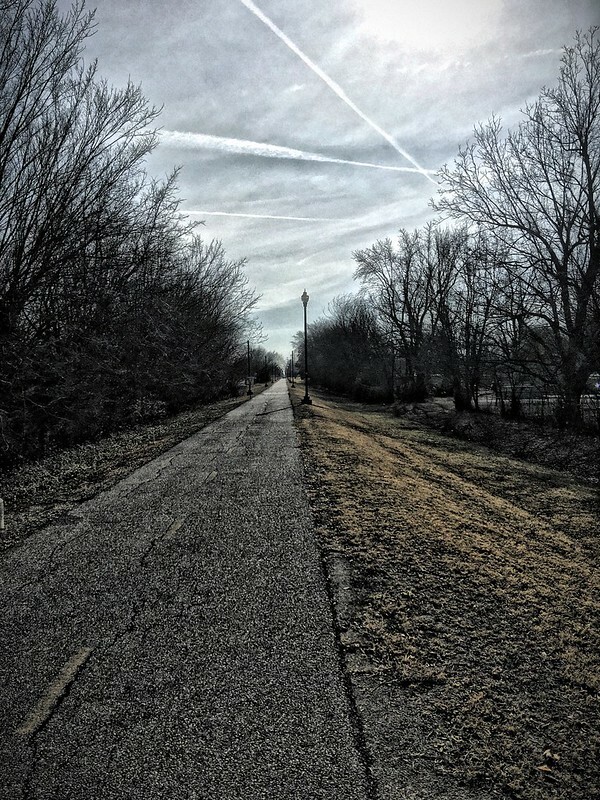 They have a rails to trails project, the Osage Prairie Trail run right through town. Its a great place to take your bicycle. I found a cache called “Railroaded” near where I took this photo. I was going to do a little geocaching while there. I ran across this sign at the first place I parked. Oops!! Luckily there were no geocaches around the sign and the weather is kind of cold. 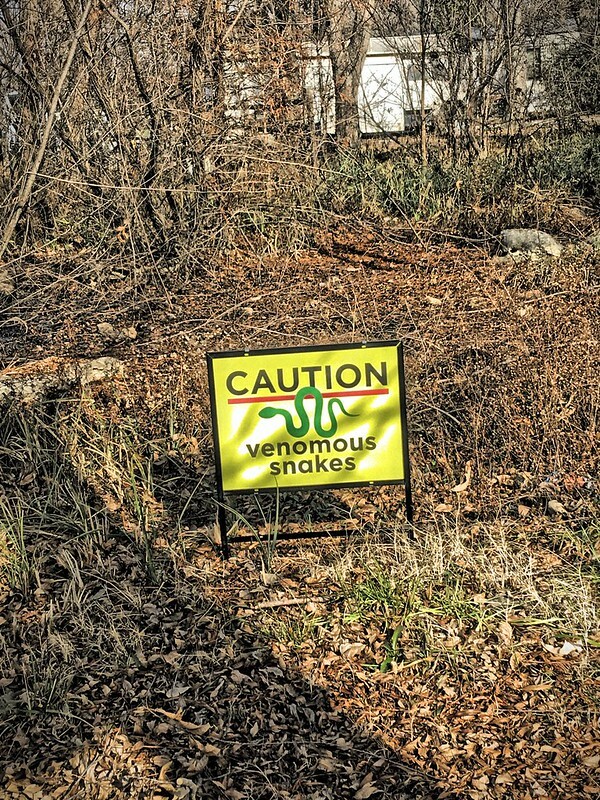 Also, there are lots of snakes in Oklahoma in areas where there are no signs. 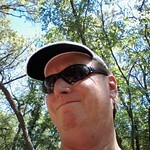 One of the caches I found was called “Dress Up” it had some items you could wear and post on the cache page. I kind of liked these glasses, especially with the hat. I almost kept them. There was another cache named “baby cache” about fifty feet away from this old gas station. I love the rock exterior. A scene from the movie “The Outsiders” was filmed here. On my way back to the office I found this “hay bale art” out by the highway. Obviously whoever put it up is one of those crazy people who like snow. Who in their right mind, over 12 years old likes snow? Only ice is worse than snow. And tornadoes, and earthquakes. How come we have all the bad stuff in Oklahoma. Not bad for a lunch hour, huh? This entry was posted in Uncategorized and tagged Snakes on December 11, 2018 by Alan Bates. What fun shots! Love those pink glasses. Those glasses are class act in it self. wow I love the way the hay bales have been festively decorated and your glasses are very cool too! What a great lunch hour. I would probably avoid that area with the sign once spring arrives. The old gas station is a wonderful reminder of simpler times. Well, count me as one of the crazy people. I do like some snow. Of course I want it gone within a few days after it arrives. I don’t care for snow that wears out it’s welcome. Hello, pretty view of the bike trail and sky. The bales of hay art is cute. I like the cool glasses. Happy Thursday, enjoy your day. Have a great weekend ahead. Your glasses are the best! 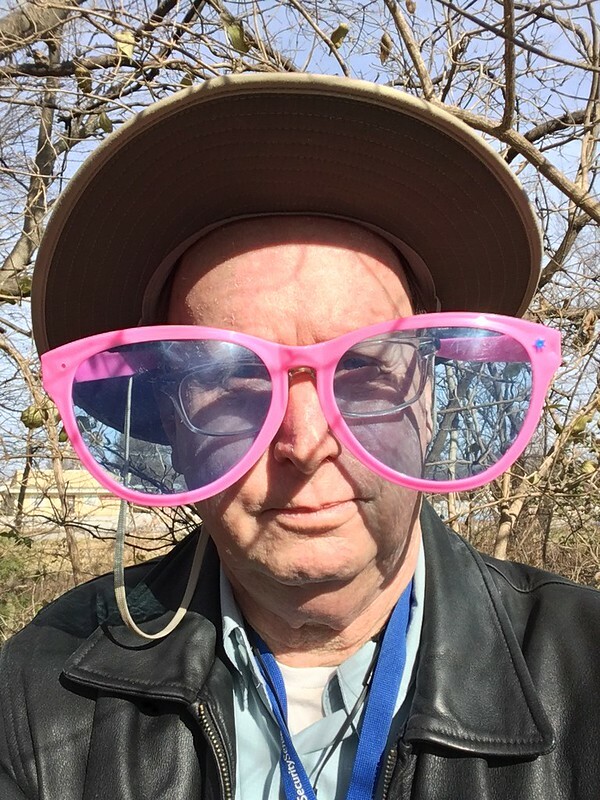 That is a great photo of you wearing the glasses and hat! I like it! The one who decorated the hay bales is very created! Have a beautiful weekend! love those glasses but careful of those snakes! I love that top photo. Very cool effects. I also love your big sunglasses, lol. Love the first one. Very nice. Would be even better in summer time I suppose. What an eclectic collection of photos from your lunch hour! Love the pink glasses on you! No, not bad! 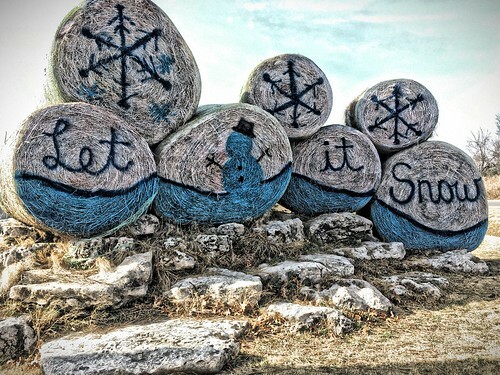 Don’t see too much hay bale art here in upstate New York, but I definitely would not vote for “let it snow”. Especially as higher elevations today where I live are supposed to get ice! I love the straight leading lines in the top image, which then clash with the zig-zag contrails in the sky. 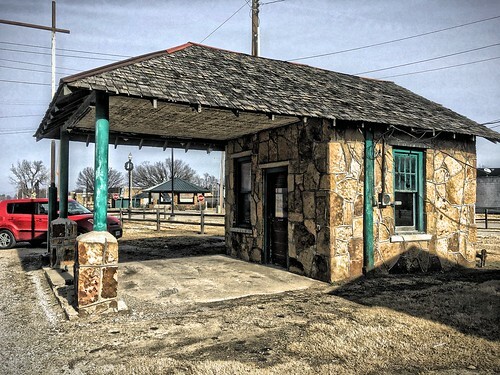 I have a photographer friend who has a passion for shooting old gas stations….though I doubt that he will drive all the way to Oklahoma. That’s a good look for you! Actually, I kind of like the glasses. Perhaps if I had a pair I wouldn’t lose them so often! I love that old gas station building. They are quickly disappearing… very few left in my area. That hay bale art is amazing. And I happen to be a snow lover, so it gets even more points in my book! You covered a lot of ground in your lunch hour … keep it coming! Enjoy your weekend. Amazed you could get all this done in one lunch hour. I can see why you like the glasses, they are definitely you. Looks like a RT66 gas station, really like the rock work. I do like the hay bale art but not so much its sentiment. Great sky, and I love those glasses! The snake warning creeps me out. that’s a lunch hour I would adore!